Friday 12th June saw six groups from Northumbria meet near to Heighington, to partake in a weekend of green field camping. The weather was bright & slightly breezy, warm enough to remain in short sleeves until midnight – nice! Everyone caught up with each other & the first evening passed well with the scouts having a large wide game up on the hill. A smattering of rain at about 2am had dried fully by morning. Saturday night had everyone around the campfire & although the singing started off a little quite, by the end everyone put their all in to it. Alan, Daniel, Alex, Clive & Julian entertained the attendees & went through skits, repeat after me & action songs. Clive’s Eskimo song is a particular treat which everyone enjoys; & a special well done to Alex & Daniel who are shaping up to be good campfire Chiefs. The evening was brought to an end with a wide game up on the hill. Sunday started very hot, & although we experienced several showers the tentage dried & was packed away with the minimum of fuss. Everyone took part in a Scouts’ Own under brilliant blue skies. The scouts then caught up with the assault course that they didn’t have time to fit in on Saturday. 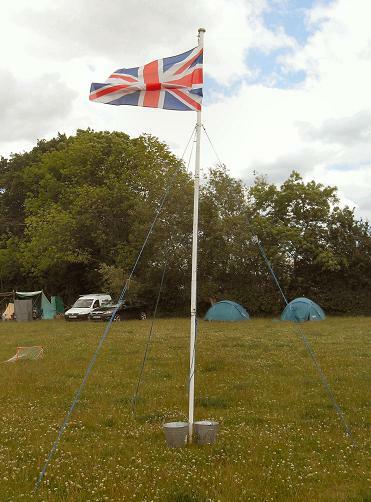 The weekend finished with everyone gathering round the flag in the rain, all were thanked for attending & our Chief Commissioner presented two leaders with their warrants & tasked all scouts with the challenge to bring their friends along to join in with Scouting!